Søk om residens i regionen Puglia, Italia for å arbeide i et særegent kunstprosjekt sentrert rundt utfordringene regionen står overfor etter at bakterien Xylella fastidiosa utryddet hele plantasjer med oliventrær. Platform Nord bidrar til at nordiske unge kunstnere i alderen 18-35 år har anledning til å søke om plass. Platform Nord, vertsorganisasjonen Bjcem og regionen Puglia dekker reise og opphold deltakerne, og følgende uttrykk er velkommen til å søke: performance / sceniske uttrykk, skrivende, fortellere, filmskapere, kunstnere fra visuelle uttrykk, designere og kunstnere som arbeider med land art / offentlige kunstprosjekt. The International Association BJCEM – Biennale des Jeunes Créateurs de l’Europe et de la Méditerranée and Puglia Region promote the special project LandXcapes, dedicated to the changes suffered by the territory of Puglia due to the epidemic breakout of the bacterium Xylella fastidiosa, which has affected entire plantations of olive trees in the Region. 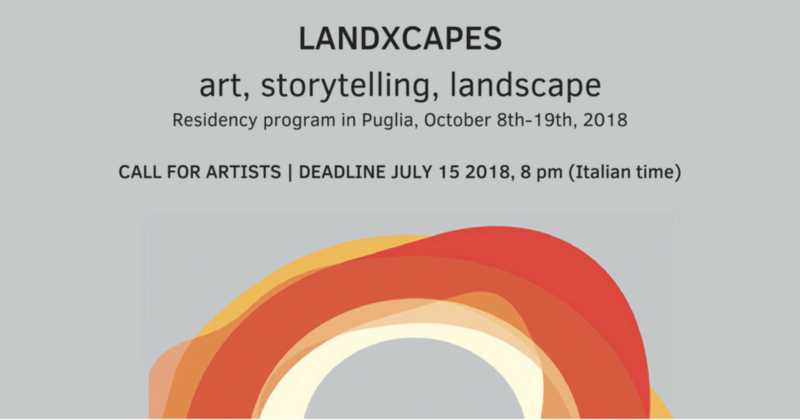 LandXcapes is a multidisciplinary cultural project of integrated enhancement of the identity and heritage of Salento, through the language of art, storytelling and landscape. The Provinces of Brindisi, Lecce, and Taranto have been stricken by Xylella scourge, and have now to deal with their identities. Art becomes therefore a tool of reflection and sharing of a fragile moment, linked in a substantial (and anthropological) way to the future life of the Salento territory. Art as a meeting point of two worlds: the productive one, and the cultural one. In the middle there is the territory, the landscape, a legacy to be delivered to future generations. LandXcapes wants to give back to the public, through art and poetic narratives of the places, the sense of the transformation (voluntary and involuntary) of the landscape, in a multidisciplinary and inter-sectorial approach. Within the general project there is a program of artistic residences, aimed at the production of artworks, coming from different disciplines (Performance, Storytelling, Design, Video/Photography, Public art/Land art, Painting/Sculpture), to be developed in a rural and naturalistic background. Artworks able to research and experiment new forms of expression, as well as enhance the cultural exchange with national and international realities, strengthening the cultural bonds and the internationalization of the cultural offer of Puglia. These creative and productive workshops will take place, in the form of artistic residencies, in six different parks of Salento (Parco Dune Costiere – Ostuni; Parco Torre Guaceto – Brindisi; Parco Otranto/Leuca – Otranto; Parco Litorale di Ugento – Ugento; Parco Porto Selvaggio – Gallipoli; Litorale Tarantino – Manduria), and will be coordinated by professional tutors. At the end of the residency there will be public presentations of the results in the same places that hosted the researches. A final public event will then be hosted by the Sigismondo Castromediano Museum of Lecce. The artists selected for the residency program will be guided by experienced tutors in the indicated disciplines and will be able to visit the places affected by the Xylella, as well as meet with farmers, olive producers, inhabitants of the affected areas, academics and researchers. The works of the artists will take place on the spot, in the territories chosen for each of the artistic disciplines indicated in the call. During the residences, the artists will compare themselves with the territory and the territory will give back the artistic action produced as site specific. The selection of artists will range between various artistic disciplines: performers, writers, storytellers, videomakers, visual artists, cultural researchers and designers will address the theme from different points of view, considering also the different cultural background of each of them. This would therefore be a way to explain and raise awareness on what is happening at Euro Mediterranean level in relation to the protection and promotion of the landscape. This Call is open to the following disciplines: Performance, Storytelling, Design, Video/photography, Public art/Land Art, Visual art (picture/sculpture). Tutors are presented below. Artists between the ages of 18 and 35 can participate to this call. Group applications are not admitted, but only individual candidates. To check the list of countries for which the call is open, please visit the following website: http://www.bjcem.org/landxcapes/ and follow the instructions for submitting your candidature, using the available application form. This call is also open to artists who have already participated in other BJCEM projects, as long as they meet the required requirements. Participation is free. No fee will be paid for participation. All the documents shall be sent to application@bjcem.org not later than July 15th 2018, at 8 pm Italian time. Project tutors will evaluate CV, portfolio and motivational letter, to establish adherence to one of the proposed disciplines. Up to 10 artists per discipline will be selected. The submission of an application by an artist automatically implies the full acceptance of the present regulations and the approval to the reproduction and presentation of the works produced by the artists during the residences for communication and promotion purposes. Considering the aims of this announcement, the artistic productions made during the residences will become part of the artistic heritage of Puglia Region. As far as design is concerned, it is foreseen that the design ideas developed during the residency period can be prototyped, by matching individual projects with the local companies operating in the cabinet-making and/or wood-furniture sector, which will spontaneously present a expression of interest to be technical partners/sponsors of the “Landxcape” project. Designers have the right to protect their project idea according to the current legislation on the protection of intellectual property. The companies involved and the individual designers can independently sign agreements for the possible production and sell of the prototype developed, according to the current legislation, and without any involvement and responsibility by Puglia Region, BJCEM or other project partners. BJCEM network and local organizers will cover participation fees of the selected artists (travel, board and lodging). Artists and tutors will be hosted from October 7th to 19th 2018through a widespread reception system, involving the farms present in the involved naturalistic parks. The law of the country in which the event takes place governs this call. Koreja Theater, Center of production and theatrical experimentation, has been active for over 30 years, has produced more than 40 shows, circulated among 45 countries of the world, won national and international awards. Cultural stratification, a new identity and marginality are the principles that define Koreja. Salvatore Tramacere has studied with important international theatre personalities such as Eugenio Barba, Iben Rasmussen, Pina Baush. Koreja’s theatrical pedagogy is based on those areas of intervention where theories and practices are immediately mixed. The proposed training path is a shared work of growth and deepening of the different artistic languages, to give instruments of interpretation of the reality through the theatre. Working on theatrical performance means elaborating a dialogue to be returned in artistic form with the places hit by Xylella, by amplifying and reworking the message. The work phases foresee, first of all, a personal research process, and then a group one, taking advantage of the different nationalities and artistic specificities of the participants, which will be themselves the authors of the performance. “Ancient wisdom taught that the Mediterranean goes far as the olive tree grows” (Predag ​​Matvejevic). We have the word, the story, our bodies to listen to a land that is changing its skin and is doing it in a daze of words, laws, information, wind and cicadas. What happens to the shape of the Mediterranean, if the olive tree line changes? What happens to Puglia if the olive trees no longer grow? What happens to its horizons, what happens in the eyes of those who live there and those who cross it? What voice has all this? Which words? What is its sound? What is the “story” of all this? Also: what, of all this, claims with blood force of earth to be told? I always wonder what will remain. In this residence, instead, I wonder what “lives”! The residence is addressed to female or male narration voices (storytellers, actors, authors), to give voice to the circulatory system that travels seamlessly between the living beings of Puglia and their olive trees. Puglia, as well as well as the countries bordering the Mediterranean basin, is a territory that has always been populated by olive threes. For this reason, and for its peculiar aesthetic characteristics, due to its unpredictable trace, this plant has always provided and supplied the raw material for the realization of home objects, furnishings and accessories. Considering the morphology of the trunk, and its structural inhomogeneity, olive tree is not a wood essence easy to process and, above all, not suitable for applications where mechanical properties are particularly important. Therefore, a creative effort is required to imagine olive wood not always and not only as the sole material protagonist of a designed object, but also as an actor interacting with other materials (technological or natural), without forgetting interactions with other potentially synergetic components such as light, smell, colour, sound, food, other plants. The key themes that will be tackled by the protagonists of the workshop will be the 4 elements (water, air, earth and fire), all essential elements for life and protagonists of the stories that, from their birth to their explant, these olive trees could tell. Identity and narration of places, of those places of the Puglia Region that transform themselves, adapt, struggle, succumb and get up, like and admire themselves even in change. An identity that comes from its geographical context and insinuates itself into the deepest roots of a culture that belongs to a complex and proud people, that made its history of its own land. A mission, an experiment, a challenge to give back to everyone what this land wants to tell us. A land that wants to be heard and told. Exploring and telling through the images the suggestion of a place, of its past and future history, of the intrinsic need to be experienced and revealed in what it was, what it is and what it could be, through visions and sounds that characterize it, through the words of those who lived it for years, and loved it. Through the hands of those who owns it every day. The eyes and the heart of this land have more interlocutors: men, plants, animals, the sirocco and the tramontana, the torrid heat and the red earth, the blinding green and the agony of change. The intent is to put Art at the service of this urgency, in particular video and photography, with their language and fullness, able to document, transform and give back a demand for story, memory and challenge. The current landscape of Salento, affected by the rapid drying of its symbolic plant, the olive tree, tells – paraphrasing Eugenio Turri – much more than we might want to know about our time. It is a pandemic that no longer concerns only the peasant population of a portion of the regional territory, but of a wider and more complex phenomenon, which has revealed the extreme fragility of the agricultural heritage, which has become radicalized towards the monoculture of the olive tree only since the Sixties. It is precisely starting from this fragility, through this residency program, that we can ask ourselves what cultural processes and inputs public art can put in place to experiment strategies of cohabitation with the changes taking place in the landscape. The artists will tackle the relationships between the needs and expectations of a rural territory that goes through a strong environmental crisis, to propose their own reflections, imagining small or large utopias and triggering a pedagogical potential to change paradigm and create new landscapes, more resilient, with attention to biodiversity and sustainability. The memory of the people who visit Puglia, it is mainly impressed by its characteristic landscape. Rich and varied, prehistoric and atavistic, it is marked equally significantly by human activities. Vineyards covered with plastic tarps, huge industries such as Ilva (in Taranto area) or Eni (in Brindisi area) testify a difficult balance between the needs of nature and man. A link of dependence, between man and nature, which has become an emergency with the spread of Xylella, in which man is called to protect the most sacred and ancient presence in the area: the centuries-old olive trees. In this context, art can be a valid tool to strengthen the bond of mankind’s dependence, to renew it, to bring back the idea that nature is a source of nourishment for man’s spiritual and emotional aspects. The fairy-tale tradition of the speaking tree is rich and meaningful of how man has always attributed to the tree a soul, and how it has always been lived as a source of profound wisdom, endowed with magical properties. From Pochaontas, to the Wizard of Oz, to the movie Avatar, the tree is the link between man and nature. The project aims to symbolically transform a secular olive tree in a sacred monument. Around it, the conditions for the public to contemplate it will be created, through weather-resistant sculptures with the function of welcoming the “pilgrim”. It will be possible to sit around it, contemplate it, observe every fold, and hear a story from each of them. Each artist, inspired by the tree and the stories from the community of people linked to the territory, will create his contribution to arrange the sacred monument, using every media related to the visual arts (sculptures, painting, photography, video…). In case of video or photographic contributions, links or QR Codes will be indicated inside the monument and displayed on smartphones. Platform Nord ledes av Fluks – Senter for ung kunst og kultur ved Fakultet for kunstfag, Universitetet i Agder.